After two days of competition with Classic (see CLASSIC REPORT here), Speed (see SPEED REPORT here), slides and jumps, the 2014 edition of the PSWC finishes with Battle on Sunday. As usual, the whole Sunday was dedicated to BATTLE. Fortunately, the weather was good, despite a small wind. 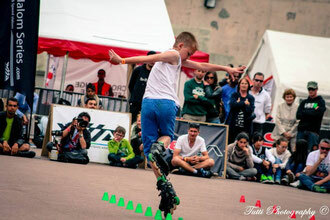 After the Saturday's qualifications, the battle competition started with the 1/8 Finals. After the 1/8 of final, where skaters were divided into 8 groups of 3 or 4, with only two runs to convince the judges, the quarter-finals followed. The 16 strongest skaters remain in the race, this time with 3 runs each. Among them, World #2 DARIA KUZNETSOVA (Rus), #3 KLAUDIA HARTMANIS (Pol), #7 ZOE GRANJON (Fra) as well as #10 ANGELIKA PRUCNAL (Pol), #14 PAULINA CZAPLA (Pol) and #15 CAMILLA MORBIDONI (Ita). Natalie Ujuk (Aus) and Cristina Rotunno (Ita) are knocked out by Daria Kuznetsova (Rus) who immediately showed her whole range of tricks, and by young Federica De Sensi (Ita) who also made a variety of difficult transitions, revealing her strong potential. Chiara Lualdi (Ita) and Anya Ziertmann (Ger) are no match compared to the two Polish skaters Paulina Czapla and Angelika Prucnal. The first runner-up of the speed slalom competition, Chiara Puricelli (Ita) and the youngest Granjon sister, Lily (Fra), leave the qualification for the semi-final round to Camilla Morbidoni (Ita), who seized the Bronze in Classic, and the older Granjon sister, Zoé (Fra). Three Polish girls, Izabela Bednarska, Justyna Czapla and Klaudia Hartmanis are competing against Spanish Bohdana Hotsko. World #3 Klaudia Hartmanis and the youngest Czapla sister, Justyna, go through to the semi-finals, leaving the two other girls high and dry. Daria Kuznetsova (Rus) and Angelika Prucnal (Pol) qualify and leave the co-final for young but greatly improving Justyna Czapla (Pol) and Camilla Morbidoni (Ita). The result of the second group were very hard to decide. Zoé Granjon (Fra) unanimously qualifies in first position. All the judges also agree that Paulina Czapla (Pol) takes the 4th place and goes to the consolation final. After a long discussion, 2 judges against one choose Klaudia Hartmanis (Pol) for the final, leaving Federica De Sensi (Ita) a whisker away from the great final, having to make do with the co-final. ► Federica De Sensi (Ita) wins the round with a good bunch of toe footguns, perfect 10-cone heel sevens, and nice toe wheeling combos. Her Last Trick, a 6-cone toe shift, finishes to convince the judges. ► Camilla Morbidoni (Ita) ends up just behind, thanks to efficient transitions and stylish moves. However, her wheeling tricks are shorter than Federica's, and her Last Trick was close to but a repetition of a cobra-combo from her first run. ► Paulina Czapla (Pol) finishes 3rd, with technical tricks but not mastered enough. She overtakes her small sister thanks to her last trick. ► Justina Czapla (Pol) gets the 4th place of the round. She does a good toe seven but doesn't succeed with her other tricks - except for a very-well performed Last Trick - a long combo of butterfly switches, twice on the 80 plus a 50, but it couldn't compete with the others'. The final group gathers two Polish, Klaudia Hartmanis and Angelika Prucnal, Russian Daria Kuznetsova and French Zoé Granjon. Daria Kuznetsova, who is the best-ranked, chooses to go 3rd. Klaudia Hartmanis sets her heart on the 1st place, Zoé Granjon chooses the 2nd one and, by default, Angelika Prucnal gets the 4th place. ► Daria Kuznetsova leads the three runs as well as the Last Trick. She highly deserves the first place: Perfect clean runs with high level tricks (christy footgun on the full 120, back seven, back toe foot gun, shifts) and combos (Butterfly, toe day/night on toe, toe shift on the whole 80)... and not to forget her Last Trick, a toe seven back and forth on the 20 cones of the 80 line. 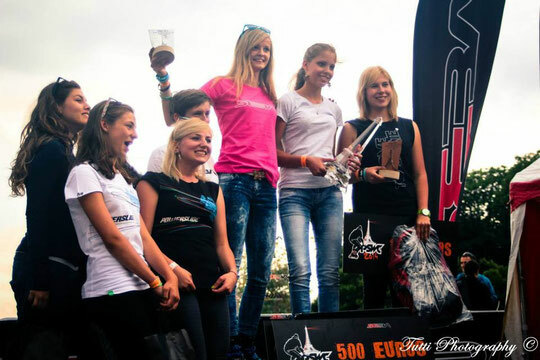 ► Klaudia Hartmanis ends up 2nd. She shows many good tricks and combos (toe shift-toe back-toe shift, cobra-toe chicken leg, back toe footgun, front toe footgun on the whole 80). And her last trick but not the least is a toe double chicken leg. All her tricks were not perfectly well executed and she takes the 2nd place of the final. ► Angelika Prucnal takes the 3rd place with good long tricks but not that many combos (20-cone back heel wheeling on the 50, toe shift toe almost for the whole 50 line, and a double toe front-back and toe shift on the whole 80 as her Last Trick). ► Zoé Granjon gets the 4th place of the round. Unfortunately she fails most of her tricks (but still she almost completes the whole 120 line doing back toe footgun, she does a 80-cone toe footgun on the 80, toe shift to toe chicken leg and toe shift on half of the 50). "All the girls were strong. Now we have such a high level that everyone could have won." "I could have done better but it was hard to do all my tricks with those ground conditions. Everyone was fighting against the ground but all my runs were good and clean. I wasn't nervous and I had a lot of fun. That's what I like in Paris, the cozy atmosphere." The men's quarter-finals are the next stage after the eighths finals. From 8 groups of 3 or 4 skaters, there are now only 4 groups left. This is when the weather started to get worse. In order to ensure good weather conditions and save the final, the organizers decide to cut down the number of quarter-final runs to 2 instead of the usual 3. Among the 16 remaining skaters you find almost the whole Top-20: World # 1 ROMAIN LEBOIS (Fra), #2 YU JIN SEONG (Kor), #5 MICHAL SULINOWSKI (Pol), as well as #6 ALEXANDRE CLARIS (Fra), #8 SERGEY TIMCHENKO (Rus), #9 ZHANG HAO (Chn), #10 LORENZO GUSLANDI (Ita), #11 GUO FANG (Chn), #14 CARLOS NELSON (Esp), #15 TEDDY THIERRY (Fra), #17 DMITRIY SHEVARUTIN (Rus), and #20 ALEX SHULHAN (Blr). Dawid Jaworski (Pol) and Alex Shulhan (Blr) are knocked out by Romain Lebois (Fra) and Carlos Nelson (Esp). Sergey Timchenko (Rus) takes the first qualification place of the group, followed by Alexandre Claris (Fra) who gets the second place. Antonio Castro Zamora (Esp) and Guo Fang (Chn) show very stylish and smooth runs but they lack technical elements... they are done at the outcome of the quarter-finals. Yu Jin Seong (Kor) does a dance routine from his run and finishes the round at the 4th place. Zhang Hao (Chn) shows the hardest combo and wins in front of Kanchanok Sawangsri (Tha), who gets the second place also qualifies for the semi-finals. Lorenzo Guslandi (Ita) ends up 3rd. Teddy Thierry (Fra) takes the first place of the group. Marcos Rezende Plinio (Esp) finishes 4th. The result of the 2nd and 3rd places have to be decided through a best trick between Michal Sulinowski (Pol) and Dmitriy Shevarutin (Rus). Two voices against one propel Michal to the semi-finals for his toe chiken leg, against Dmitriy's 20-cone seven. Sergey Timchenko (Rus) takes the 1st place with very clean and varied runs, while Romain Lebois (Fra) takes the second place. They leave the co-final to Kanchanok Sawangsri (Tha) and Michal Sulinowski (Pol). Zhang Hao (Chn) leads all three runs hands down and reaches the final with the first qualification place. Alexandre Claris (Fra) is just behind and goes to the final too. Carlos Nelson (Esp) and Teddy Thierry (Fra) go to the co-final. 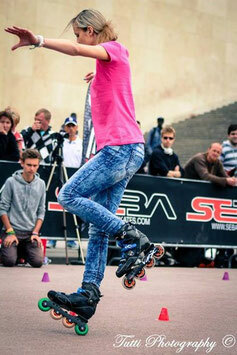 ► All the skaters of the co-final are highly technical and show their best for the last straight line. Three of them, Kanchanok Sawangsri, Michal Sulinowski and Teddy Thierry even try to beat one other with the same types of tricks. They all start their first runs doing christy footgun on the 120 and do toe shift with different transitions on the 80. Carlos Nelson follows his own way with toe shift on the 50 and toe seven on the 80. ► For his second run, Carlos does perfect wheelings and toe footgun on the 120. The other three keep on fighting with transitions, toe shift and toe day-night on the 50, seven on the 80. ► As a Last Trick Kanchanok Sawangsri does toe christy footgun on the whole 120, and goes for the 80 with toe footgun but doesn't succeed. Thierry Teddy does a nice 5-cone toe performance on the 80. Michal Sulinowski does a good transition from toe shift on the 80 to the same trick he did previously on 6 cones. Carlos Nelson does toe shift for half of the 80, transitions to the 50 and continues for a few cones. ► Michal Sulinowski (Pol) wins the co-final, taking the 5th place of the battle. ► Carlos Nelson (Esp) finishes just behind with the 6th place. ► Kanchanok Sawangsri (Tha) gets the 7th place. ► Teddy Thierry (Fra) ends up 8th. The final group gathers two French - ROMAIN LEBOIS and ALEXANDRE CLARIS, Russian SERGEY TIMCHENKO and Chinese ZHANG HAO. Romain Lebois, who is the best-ranked, chooses to go 1st. Alexandre Claris opts for the 3rd place, Sergey Timchenko chooses the 4th place and Zhang Hao makes do with the 2nd place. The skaters show great performances of the hardest tricks and transitions of the moment. 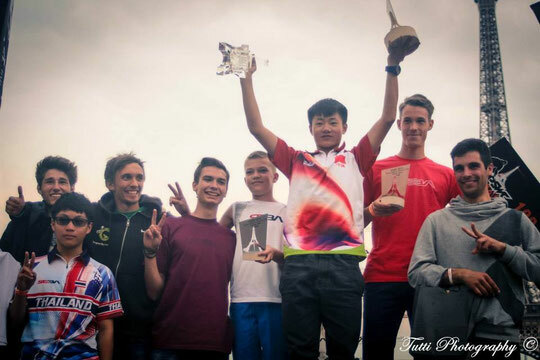 ► Zhang Hao leads all through the final and easily takes the first place of the battle. He shows incredibly long and hard transitions on toe. He does almost every trick almost on 20-cones, very clean and fast execution. ► Sergey Timchenko takes the second place with hard combos too. The young skater is improving very fast. He does good difficult runs and finishes the final right behind Zhang Hao. ► Alexandre Claris gets the 3rd place. He performs quite well but some of his tricks are not successful or not as long as those of the first two skaters. ► Romain Lebois is 4th of the round. He has good prepared runs but his rate of success is lower and he fails doing his last trick. The world #1 and battle winner of the 2 last editions finishes at the foot of the podium this time. "For me, the final was the most difficult part because I was already tired after all the runs of the previous rounds." "There were so many strong opponents that it was more difficult for me to go through the 1/4 and semi-finals than to fight in the final. Waiting for the results of my semi-final group, I didn't think I would qualify for the final, I thought I would go to the co-final."